Tungsten Analysis: WC Preview Part 4 - Another semi final for Gurney? WC Preview Part 4 - Another semi final for Gurney? What a season for Gurney. Jesus christ. He's gone from a solid top 32 player who had a good run last season to a Premier League certainty, major winner and top 5 player in the world in the space of twelve months. When I do my end of year awards, it's only a question of whether I give him best player or most improved player, a lot will depend on what he does here. His UK Open qualification wasn't fantastic, needing a win in the main event just to make the money, but from there he had no worries making the quarter finals, where he edged Simon Whitlock before losing to eventual champion Peter Wright. Claiming his first title the month after, the first of what would be four floor finals in the run up to the Matchplay, the question then became could he convert this over longer format matchups - this was answered by holding his nerve in overtime against Benito van de Pas, sneaking past Gary Anderson in a high quality matchup, before seeing off Mensur Suljovic in a race to 16 to make the semi final. He held his own against Wright to just lose by the one break, 17-15, but after some nice World Series exploits it would be Dublin where he really made his name. A somewhat weakened field with no Taylor, no Anderson and then, thanks to John Henderson, no van Gerwen, it was open and Gurney took his chance - coming through a tough opener against Adrian Lewis, he held off a comeback attempt from Joe Cullen in the next round, then at the quarter final stage needed to show resilience to win a deciding set against a resurgent Robert Thornton. With Wright and Barneveld losing at this stage, it was looking like he had a chance - he took out surprise semi finalist John Henderson before overcoming Simon Whitlock in an epic final to claim a first ranking major. Since then he's not let up - he avenged the loss to Wright in Hasselt but was thoroughly outplayed by Cross in the semi final, dominated his Grand Slam group, annihilated Wade then got demolished by Taylor in the quarter final, and had a solid run at Minehead recently before a surprise defeat to Justin Pipe. He's arrived now, and is the hunted, not the hunter. Ronny Huybrechts hasn't had a bad season at all, with the highlight coming early in the season in the UK Open qualifiers where he reached the final of event 5 - hitting a nine in a run that saw him beat Gary Anderson, Terry Jenkins, Ian White, Darren Webster and Michael Smith (four of those five being in deciding legs) before losing to Simon Whitlock. In the main event he'd probably be a bit disappointed to lose 10-4 to Vincent van der Voort, not a harsh draw and one he should have kept closer. He couldn't quite make the Matchplay, but a couple of good European runs in the run up to the Grand Prix got him both to Dublin and Hasselt, where he lost 2-0 to King and 6-5 to Price, the latter being very disappointing as he led 5-3 with the darts. He'd nearly make the Grand Slam but lost in the final round of qualifying, and also lost in the first round at Minehead to Steve Beaton, rounding off a season where, while he'll be happy to have made plenty of the major tournaments, he may wonder whether he couldn't have done more once he got there. 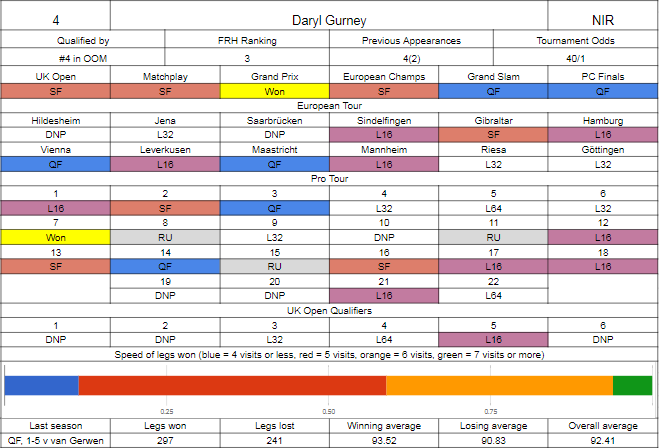 Gurney's stats don't appear that fantastic given the amount of work he's done this year, which is a touch surprising and I'm not entirely sure why. His percentage of legs won in five visits or less is under 60%, and there's lots who are well above that who don't have quite the same results - Gerwyn Price, Darren Webster, Ian White, Joe Cullen, John Henderson, Stephen Bunting to name just a few. His 12 darter percentage is at least in double figures, but only just, and while his averaging in losing legs is pretty consistent compared to those he wins, indicating he's applying a fair bit of pressure, I'm not sure it's enough to explain everything away. 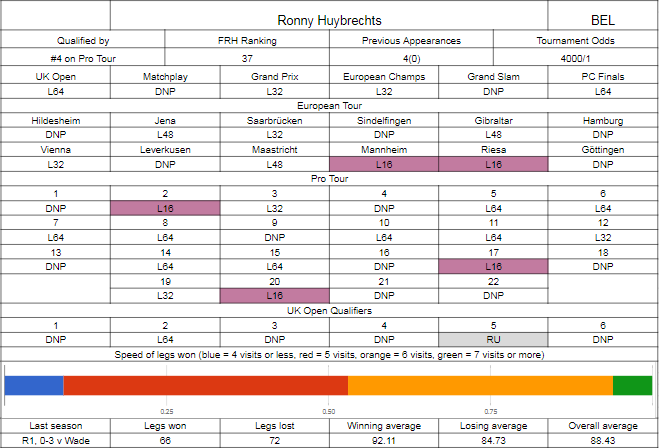 Huybrechts is not that far behind, but is clearly behind, and to have any sort of chance he'll need to eliminate those legs where he starts something like 59-100-60 and the like. It's a very tough ask and I can't see past Superchin getting it done here. Again, a warning about sample size. Kantele's won twelve legs in the database. 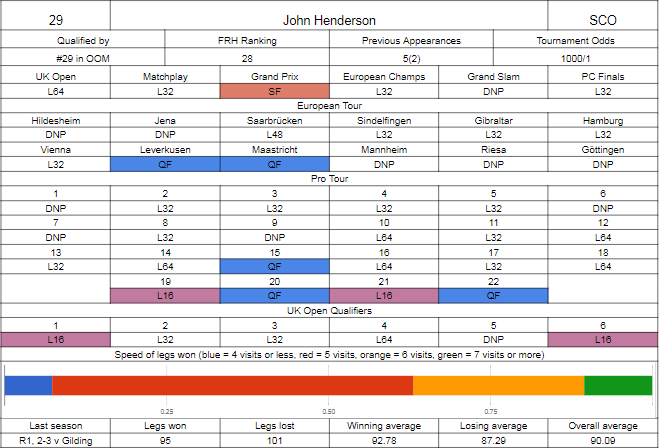 There's one enormous highlight in John Henderson's season, and that's the outstanding performance in the Grand Prix, where he reached the semi final. Along the way, he of course knocked out Michael van Gerwen, Alan Norris and Raymond van Barneveld, a very respectable hat-trick of scalps, before running out of steam against Daryl Gurney, and here he looks to set up a possible revenge match in round two. The rest of the season has also been decent as he's consolidated a top 32 position - he did more than enough to get straight to the money in the UK Open, but drew Michael Smith and didn't get close, lost by the same score to Mensur Suljovic in the Matchplay (10-4), and had a great European season where he qualified for more than half of the events, making two final sessions, which got him to Hasselt, but got blitzed by Kyle Anderson. He's been solid on the floor, ramping things up towards the end of the season, doing enough to get a winnable first round game against Darren Johnson, but couldn't pin a 117 out against Ian White in the deciding leg in round two. Still, all the form has been towards the back end of the season, which is a good sign for the big popular Scot. Kantele finished second in the SDC rankings, a distant second behind a dominant Kim Viljanen, but comfortably ahead of familiar names Dennis Nilsson, Magnus Caris and Daniel Larsson, mainly through winning a couple of the events. 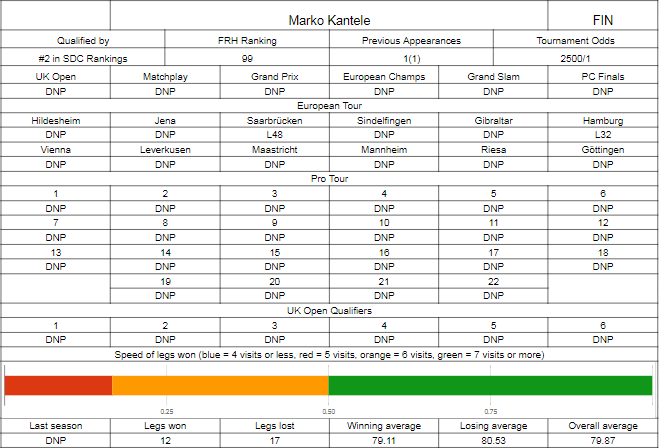 He's in the first round through money earned in the Order of Merit, albeit only just, with him managing to get through the touch Nordic/Baltic qualifiers on two occasions to reach Saarbrücken and Hamburg. The first one was a possible surprising loss to Warrick Scheffer but I recall he was playing OK at the time, while in the second he beat Alcinas in a deciding leg and was able to claim three legs off Alan Norris on the Saturday. He's been here before, but not since Co Stompe was a quarter finalist, so going back a while - last time here he beat Lourence Ilagan in a preliminary game, and took a set off Ronnie Baxter in the first round proper. Even further ago than that he played Lakeside in 2005, and was able to knock out Tony O'Shea before losing in the last sixteen to Simon Whitlock. It was long enough ago that it was the last one that Barney won. I think Henderson's in strong enough form that Kantele doesn't stand a realistic chance - when Kantele's played in Europe, he's mostly won legs because his opponent has let him, rather than because he's taken them, only averaging 80 when losing, which beats his average when winning. That said, Henderson's action is incredibly rhythm based and if it's not clicking it's very hard to put right quickly, although in this one he should be able to get away with holding his throw together using string, gaffer tape and MacGyver's book "How to win Darts Matches averaging 81".